A visit to BAPS Shri Swaminarayan Mandir can be an awe-inspiring, educational and enriching experience. With so much to see and do, we recommend at least two hours for a comfortable visit, though many end up staying longer. If this is your first visit to the Mandir, we suggest you familiarise yourself with the simple admission guidelines provided here. This will ensure you have a safe and pleasant time. To help plan your visit, see also the latest weather forecast for Neasden here. Visitors arrive through the gate on Meadow Garth. (Remember to leave any bags in your vehicle or deposit them at the Baggage Cabin in the car park.) You can enjoy your first full view of the Mandir from the courtyard. The Haveli is a cultural centre complementing the traditional stone temple. It includes a large prayer hall, classrooms, gymnasium, crèche, and other facilities. The first place that you may come to stop will likely be one of the two atriums. Take some time to appreciate the profuse carvings around these sky-lit inner courtyards, from the columns right up to the windows, walls and ceilings – not forgetting to look down again at the traditional Indian designs on the colourful carpet. More details about the Haveli can be found here. The heart of BAPS Shri Swaminarayan Mandir is the Maha-Mandap (‘Great Hall’, or sanctum) found on the upper floor of the stone temple. Here, too, take some time to appreciate the intricate carvings of the marble columns, arches, ceilings and, of course, the exquisite cantilever dome. If you have timed your visit right, the shrines will be open and the sacred images will be offering darshan in their graceful adornments. (Check timings here.) Learn about Bhagwan Swaminarayan, to whom the Mandir is dedicated, and other important deities of the Hindu faith, including Krishna and Radha, Rama and Sita, Shiva and Parvati, and Hanuman and Ganesh. Many visitors also spare a few moments to sit in meditation, prayer or reflection under the dome. It is an opportunity to be surrounded by beauty and serenity. We encourage everyone to take in the peace and tranquillity. More details about the Maha-Mandap can be found here. One of the highlights of a visit to the Mandir is to witness the late-morning arti ceremony, performed daily at 11.45am. It is an ancient Hindu offering made by waving lighted wicks before the sacred images to the accompaniment of a musical prayer. Many visitors have described the experience as awe-inspiring. More details about the arti ceremony can be found here. Please especially note the seating arrangements during the 10-minute ceremony. If you missed the arti – or even if you didn’t – there is still an opportunity to participate in another Hindu ritual by performing an abhishek in the Abhishek Mandap. This is an ancient Hindu practice of pouring water over the sacred image of a deity (Shri Nilkanth Varni, in this case) to the chanting of Vedic verses. If you wish to participate in the puja ritual, the whole ceremony will take approximately 15 minutes. Follow the links for more details about the Abhishek Mandap and the abhishek ritual. Appreciated by both children and adults, this is a permanent exhibition spread over 3,000 square feet on the lower floor of the Mandir just opposite the Abhishek Mandap. Using 3D displays and traditional craftwork, it provides a valuable insight into the origin, beliefs and values of Hinduism. Visitors can also learn about the contribution of Hindu seers, and how the world’s oldest living faith is thriving today through traditions such as the Swaminarayan Sampradaya. The exhibition also features an 11-minute documentary which narrates the Mandir’s religious significance and the story of its creation – from inception to ceremonial consecration. The Souvenir Shop can be found in the central foyer as one enters and leaves the Haveli, flanked by the two sky-lit courtyards. It is filled with a wide selection of books, postcards, CDs, DVDs, herbal products, and gifts for all ages, tastes and budgets. They can serve as a great memento of your visit or make wonderful presents. Be sure to visit before you leave. To find out more about what is available, please click here. 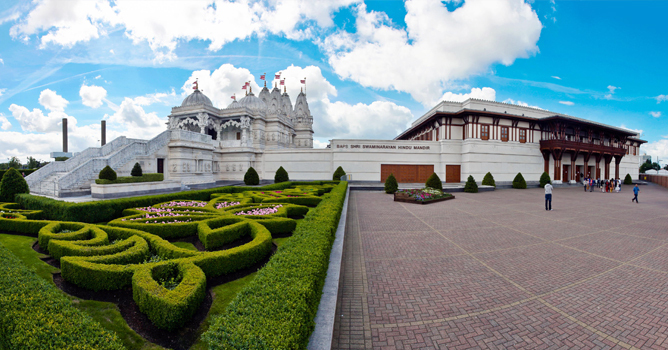 Once outside again, you can also take a stroll around the award-winning garden at the front of the Mandir. Its sculpted flowerbeds come alive in all their glorious colours during the spring and summer, while the lush lawns, evergreen yews, and intricate patterns of topiary (green shrubs) can be enjoyed all year round. Regrettably, entry into the garden area is closed during inclement weather and days of special observances. More details about the garden can be found here. If you have a camera featured in your phone, this may be the time and place (with the Mandir in the background) to take a photo of yourself with your companion(s) as a memento of your visit. Please note that photography or filming inside the buildings is strictly prohibited. Postcards and photographs showing the interior of the Mandir and Haveli can be purchased from the Souvenir Shop. Why not complete your visit with a meal at the delightful Shayona restaurant? With traditional Indian décor and mouth-watering vegetarian cuisine, it is the perfect way to experience some authentic tastes of India. Find it at the far end of the car park opposite the Mandir. En route to the Restaurant is a delicatessen offering a selection of fine Indian sweets and snacks, while the adjoining shop also offers a wide range of Indian groceries and produce.